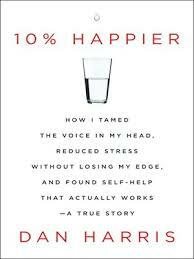 Part memoir, part expose of self-help gurus and part genuine, personal advise, self-help book, 10% Happier is a fun read by top journalist with solid background in the field of religion reporting. I am familiar with some meditation techniques having practiced many years ago, but this book was recommended by a friend and it sounded interesting. By happenstance it also got me re-interested in meditation itself. After an on-camera panic attack in 2004 Harris sought psychiatric help and then found himself reporting on religion for ABC News. This is the well told, often quite funny, story of what he found including critiques, exposes and recommendations re some of the most prominent self-help gurus on the market, Ted Haggard, Eckart Tolle, Deepak Chopra, Joe Vitale, James Arthur Ray, Mark Epstein, as well as some atheists. But the bulk of the book is directed at the ideas and practice of mindfulness and meditation as Harris studied and practiced (and fought with) them. After practicing the very basic techniques in his daily life For several months, Harris attended a 10-day silent seminar which almost undid him, but eventually lifted him into an area of being, as he describes it, 10% happier. But still he had challenges, mostly work related. His last challenge, the one which had plagued him from the beginning, was related to a discussion from his childhood: “the price of security vs the wisdom of insecurity” became Buddhist principles vs ambition and trying to find a balance. And Harris continues to work on “mindfulness, happiness, and not being a jerk” because those are the skills of living. I recommend this book to anyone interested in Buddhist meditation at a beginner level. It got me re-started on meditation and mindfulness as well as looking at the books and authors which influenced Harris.